Circus feats to a swingin’ beat! Its impossible to hear swing music without a smile on your face or tapping your feet. This event is suitable for complete beginners and improves dedicated to all things swing will have you jiving and jitterbugging in no time! 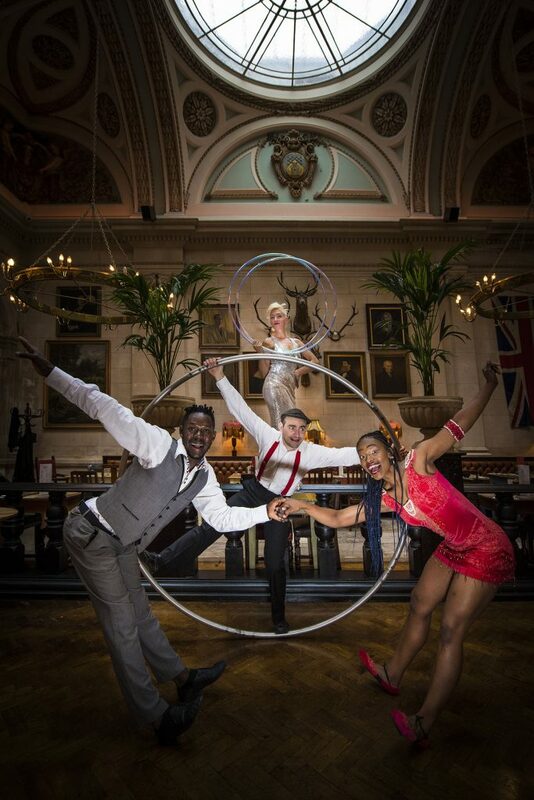 You’ll meet specialist Charleston choreographers from BBC’s Strictly Come Dancing and get a chance to have a go yourself, you'll also see the incredible skills of top UK circus performers including hulahoop, cyr wheel and juggling. We start the afternoon with our dance and circus workshops from 4-6pm (see below). Followed by a dinner break and a cabaret show featuring displays from world-class swing and circus performers. In the evening, the dance floor will open up for those who want to strut their stuff. Learn to shake it and kick it on the dance floor with another dancer! In 40 minutes we’ll have you moving and reacting to a partner (we rotate dancers through the session, so don’t worry if you don’t come as a pair!) You’ll feel the rhythms and learn classic moves from the styles of the Swing era (1920s-40s) including partner charleston. It’s all about gettin’ loose and having fun with each other, no experience required. Swing dancing is rooted in black african rhythms and movements. To learn how to really swing it, you gotta get down with the roots! This solo dance workshop will show you how to get low, get loose and release your body to the rhythms! It’s big, it’s bold, it’s cheeky and full of energy, come join the Swing Roots workshop with Precious Onyenekwu Tatah (dancewithpresh on Instagram). Try your hand at juggling, hat manipulation and hulahooping! Learn from world-class circus teachers, who you will also see performing in the Swing Circus cabaret show. It’s all about having a go and getting a glimpse of the circus world. How we learn, how we train. In circus training we don’t use the phrase “I can’t do that”, add a “yet” on the end and you’re speaking our language! You can also book a meal ticket to get some delicious food on Saturday and Sunday! The creme de la creme of the circus and dance world perform each of their specialities in a Swing Circus cabaret show - including our specialist lindy hop choreographer from BBC's Strictly Come Dancing, high level hulahoop, cyr wheel, hand-balancing and juggling, plus the joyous combination of traditional african and afrofusion jazz dance. Compered by the ever-lovable and always hilarious Marky Jay. After the workshops and the cabaret show we are all going to strut our stuff on the dance floor - come join us! With a mixed soundtrack of traditional swing, some modern swing fusion, and some more rootsy african tracks there is something for everyone from any part of the day with us. Try out some partner dancing, dance your own solo jam, or practice some newly learnt circus skills (we’ll find you space! ), whatever you do, just get involved and have fun in the Swing Circus! Please note: tickets for Swing Circus on Saturday and Sunday include both a workshop and an evening performance (the workshops start 4pm, the evening performance at 7pm). If you wish to only attend the evening performance, please book for Friday.